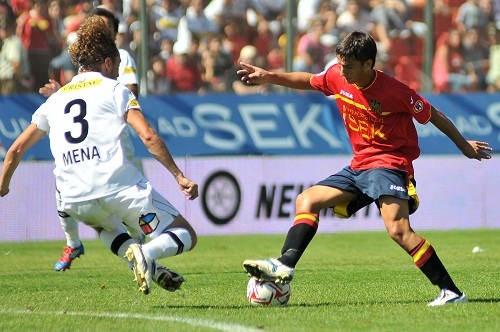 Herrera scoring for Union Espanola. Montpellier continued to improve their squad for the new season today with the signing of 25-year old Argentine striker Emanuel Herrera. Joining for a few reported to be around €2 to 3 million he becomes Montpellier’s fourth signing and of course takes the instant tag of Olivier Giroud’s replacement. Herrera arrives from Chilean club Unión Española who finished 5th in the national championship and reached the Last 16 of the Copa Libertadores with the Argentine scoring five goals in South America’s premier club competition. So to get the best insight into what sort of player Montpellier were buying we went straight toChilean football expert Joel Sked and he gave us the low-down on La Paillade’s new recruit. A quiet week in Chile? No not really. So what is in store for Week 11. Unión Española and Colo Colo took part in arguably the game of the year so far and one of the best games anywhere The Red One has witnessed this season. High-tempo football? Check. Goals? Check. Unreliable defences? Check. Elsewhere Cobreloa suffered a Nelson Acosta hangover in Santiago while Santiago Wanderers of Valparaíso were brought back down to Earth with a bump in Santiago, blue is colour in the top places of Apertura and there was varying degrees of success for new (and relatively new) managers. Off the field there is a worrying situation developing at Colo Colo between certain players and fans while we look ahead to the first big Santiago derby and share some transfer news surrounding two of Chile’s most promising defenders. As hundreds made their way towards the exit to begin a mass exodus others stayed behind to whistle, jeer and boo. It was a familiar sight at the Estadio Monumental as Colo Colo once again disappointed; falling to a 2-0 loss to Deportes La Serena. Ivo Basay’s job in charge of Los Albos is hanging by a single thread. Defeat against Cobreloa on Saturday and that thread will snap. Win and the thread will be strengthened, there’ll no long be the same weight pulling on it. At least for another week anyway. But the departure of Basay looks inevitable with Colo Colo in a lowly 11th and little signs of improvement. Universidad de Chile are Universidad de Chile. They have a quality manager, talented players and most importantly they have an ideology. Universidad Católica and their coach Mario Lepe have also come in for criticism from fans but away from their inconsistency they have quality throughout a balanced squad. If anything they have too many options. Colo Colo are trailing their Santiago rivals on and off field. They have a top heavy squad which still relies on the predatory instincts and guile of Esteban Paredes as well as midfield maestro Rodrigo Millar while the promising striker Carlos Muñoz has struggled. 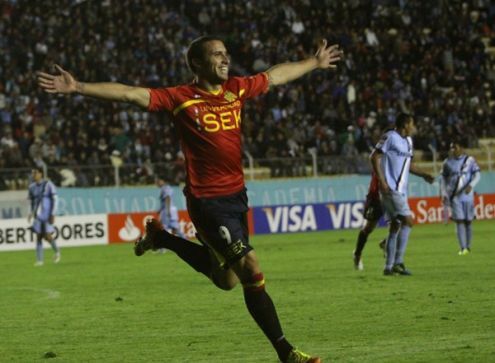 The defensive vulnerability was again on show in the defeat to La Serena. Committing players forward and playing with a high line there was no protection offered to the defence. Every time La Serena won possession they looked as if they could score at will, quickly transitioning from defence to attack. They may have ‘only’ conceded seven goals in seven games – the fifth best defensive record in the league – but it is made worse by the fact they have only scored seven goals despite the abundance of attacking options. 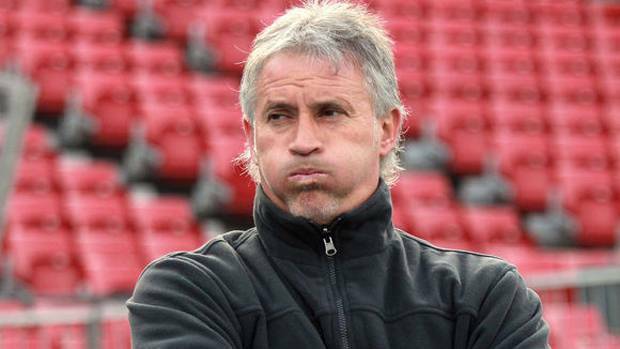 Against an organised and structured Cobreloa Basay will have to spend a substantial time on attacking movements if there is any chance of keeping his job with El Cacique. Not to forget the weakness in defending counter-attacks. Loss, win, draw. Not the start to the Copa Libertadores campaign Universidad de Chile expected but in a tough group and with two away games out of the way after yesterday evening’s 1-1 draw in Uruguay with Peñarol La U are in a position of strength to reach the knock-out stages. However Jorge Sampaoli felt that their position could have been even stronger if they made the most of their pressure in the second half. The home side may have felt slightly aggrieved at going into the break level as Junior Fernándes cancelled out Nicolás Freitas’ opener. Peñarol had visibly upset El Chuncho’s rhythm in the first half, penning the Chileans midfield in their own half and causing the backline an abundance of problems with their direct play in to ex-Juventus striker Marcelo Zalayeta. Sampaoli changed the flow of the game with the introduction of Gustavo Lorenzetti at half-time and Universidad de Chile looked the more likely team to collect all three points. 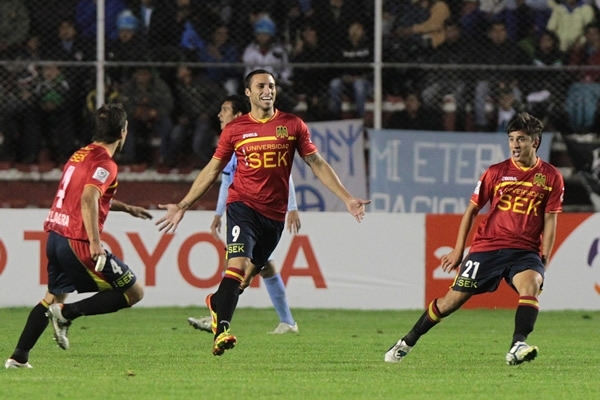 Unión Española put back-to-back league defeats behind them to defy pre-match expectations and win at altitude in La Paz against Bolívar. 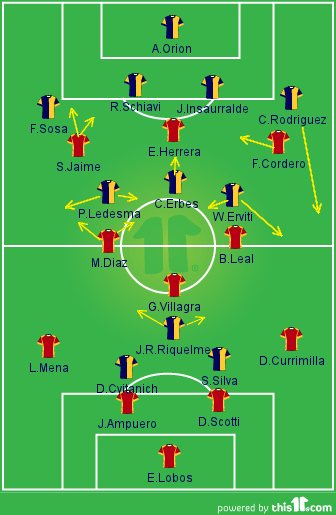 Trailing 1-0 inside the opening minute, La Furia Roja looked to be heading for a third straight defeat, but after surviving a number of first half scares the Chileans responded with three second half goals to record their second win of the Copa Libertadores; putting them top of group 3. 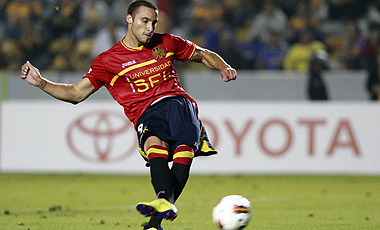 Española barely had time to settle when the Bolivians ran through their midfield to set up a cross from the left. The cross was not defended by José Luis Sierra’s side and Edhemir Rodríguez nipped in-front of his marker and saw his flicked shot come back of the post but he was the quickest to react to the rebound and made sure from a few centimetres out.